Cam Newton led the Panthers on three fourth-quarter touchdown drives on Sunday. There is the team the Eagles have been for 27 quarters of football this season, and then there's the team that forgot to show up in the fourth quarter of Week 7's shocking collapse. 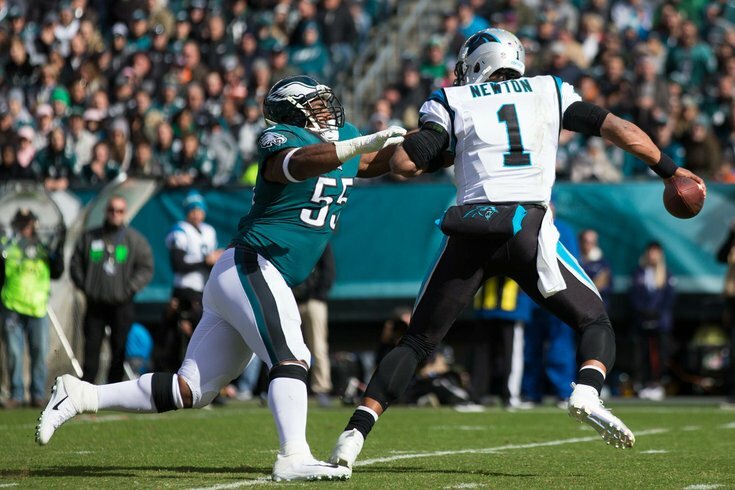 In Sunday's 21-17 setback against the Panthers, the Eagles defense was simply dominant for the first 45 minutes of the game before surrendering 21 points in the final frame. Is a desperate Doug Pederson hoping to make the Eagles underdogs again? The Panthers mustered just 145 yards of offense on 31 plays through three quarters, but turned it on late in the game gaining 236 yards on 27 plays in the last stanza. Part of the blame, no doubt, goes to the Eagles offense, which couldn't stay on the field to protect a 17-point lead. But part also goes to the Birds defense — particularly their inability to get off the field on third down. Carolina was 0-for its first five third down conversion attempts. They converted five of six in the second half. In addition, the one failed third down conversion in the second half led to a fourth-and-10 conversion to set up the go-ahead touchdown. The breakdown comes as even more of a surprise after taking a look at some telling stats from the Eagles' first six games. Coming into action in Week 7, Philly had the third best third down defense in all of football, allowing a first down just over 29 percent of the time (trailing two elite defenses in the Vikings and Ravens in that category). If the defense had been able to pull things out for 15 more minutes, they'd have similar metrics to those of the NFL's elite units. Last year the Eagles were exactly third in defensive third down percentage as well, with opponents held to a 33 percent clip. The Eagles allow just between three and four third down conversions per game — lower than the NFL average which is closer to five or six. Philly's success in stopping conversions isn't limited to third downs alone. Heading into Sunday, the Eagles allowed only 17.7 first downs per game, the third best in the league (behind Baltimore and Chicago). Of course, in their most recent disappointment, the Eagles wound up allowing 19 first downs, most of which, of course, came in the latter portion of the game. The results may not all be instantly visible with Philadelphia a modest 3-4 with one game remaining until their bye, but a deeper dive into their defense does show the team has a unit that can be — and, like through three quarters on Sunday, has shown it is — among the best in football. Unfortunately for the Eagles, there are four quarters in a football game.